World number 10 Sergio Garcia brought his sparkling 2017 form into the SMBC Singapore Open on Thursday with a five-under-par 66 to take a share of the clubhouse lead. Garcia was tied for top spot with American Kurt Kitayama, a Monday qualifier who is in a rich vein of form, when play was halted for the day after a weather delay at Sentosa Golf Club. Thailand’s Tirawat Kaewsiribandit, who was joint 11th alongside Garcia at last year’s SMBC Singapore Open, was level with Garcia and Kitayama on five-under after 16 holes when play was stopped. He kickstarted his round with three straight birdies from the 16th (his seventh hole of the round after starting at the 10th) After cancelling out a birdie at the fourth with a bogey at the next, he picked up a stroke at the par-five seventh to join the leaders. South Africa’s Louis Oosthuizen, a course specialist after runner-up and third place finishes in the Singapore Open, was standing over a long birdie putt at the par-three 17th to take the outright lead on six under when the hooter sounded to stop play. The 2010 Open Championship winner showed his liking for the course with birdies on the fourth, seventh, 10th, 13th and 16th. Multiple winner Gaganjeet Bhullar of India is four under after 17 holes with the par-five 18th to play while Australia’s Lucas Herbert is on the same number with four holes to play. They will finish their rounds on Friday morning with a 7.40am start. Casey O’Toole, who fired the first ace of the season at the second hole, Koumei Oda of Japan and India’s Jyoti Randhawa are safely in the clubhouse in joint seventh place after matching 68s. 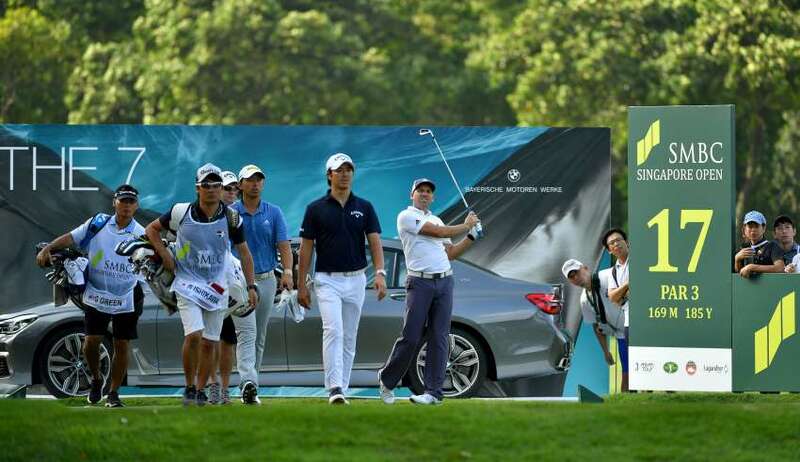 Followed by a big gallery at Sentosa Golf Club, Masters champion Garcia got into his stride around the turn after a slow start that included a bogey at the 15th hole (his sixth of the day after starting at the 10th on the Serapong Course). Garcia converted an 18-inch birdie putt at the par-three 17th after a brilliant tee shot and then eagled the par-five 18th from three feet after a great approach. The Spaniard, whose appearance here last year was a precursor to a golden year that included his first Major win and two other victories, kept up the momentum with a birdies at the second and fourth holes. He missed a five footer for eagle at the 14th but the tap in birdie took him to five under par for the day – the score he finished on after four rounds last year when he tied for 11th. Kitayama continued his dream week with a near-perfect round. He shot six birdies and was bogey free for 17 holes before dropping a stroke at his final hole of the day (the ninth). Last Sunday, Kitayama celebrated his 25th birthday by finishing tied-third at the Asian Tour Qualifying School to earn playing rights for 2018 before flying to Singapore and winning a spot in the tournament with a 65 over the Tanjong Course on Monday. “I feel really good. I started with a birdie and I just let it roll from there. I had some good tee shots, which I think, is the biggest thing for this course.,” commented Kitayama, who has been playing on the Web.com Tour in the United States for a couple of seasons. Countryman O’Toole had a round to remember, shooting the first ace of the 2018 season on the Asian and Japan Tours. O’Toole, who missed the cut last year, holed out at the 168-yard, par-three second with a seven iron and won a five year Shangri-La Hotels and Resorts Golden Circle membership worth 500,000 points. He also carded four birdies and three bogeys in an up and down round. Japan star Ryo Ishikawa, playing in the marquee group alongside Garcia and Asian Tour number one Gavin Green, recovered from going bogey-double bogey early in the back nine to birdie his final two holes (the eighth and ninth) for a two-under 69. Green rued bogeying two of the par-fives in his even par 71. Defending champion Prayad Marksaeng of Thailand shot a 72 with playing partner Younghan Song, the 2016 winner, a stroke better off. World number 16 Pat Perez is two over with three holes to play.